Homebridge’s training program provides accessible, high-quality training, education and resources for personal care providers and family members who support the elderly and people with disabilities to live independently at home and in the community. Our training program is one of the most advanced in the United States. We understand that adults have different educational needs than those of traditional students. We use an adult-centered learning model in all of our training programs, focusing on the learner as an active participant in the learning process. Trainings are provided by experienced instructor, using competency-based materials, and in our state-of-the-art training facilities. You must be an IHSS Provider in San Francisco and must have had an active client within the last 12 months. You must be registered for the training at least one day in advance. While you can take the same training multiple times, you can only receive the stipend for the same training every two years. If you do not follow the prerequisites above, you can still sign up for the classes but you will not receive a stipend and must pay the class fee. INTENSIVE, 16 EVENING LONG CLASSES. TOTAL NUMBER OF HOURS: 48 hours total (divided by 16 evening classes). THIS CLASS IS DESIGNED FOR: Independent providers already enrolled in IHSS program that have active clients within the last 12 month (contact the Training department for more information). If you are not a independent provider, you are still welcome to take the class but must the class fee. Contact the Training department for more information (415) 400-7570. STIPEND: $400 total (read below to see if you qualify). STIPEND DETAILS: To qualify for stipend, you must be an IHSS Provider in San Francisco and must have had an active client within the last 12 months. You can take the same training multiple times but you can only receive the stipend for the same training every two years. Provider workshops are usually several hours long and cover diverse set of subjects, from CPR to specialized classes, to help you strengthen your skills. HOURS PER CLASS: 2 - 8 hours, varies per class. OUR WORKSHOPS ARE DESIGNED FOR: Independent providers already enrolled in IHSS program that have active clients within the last 12 month (contact the Training department for more information). If you are not a independent provider, you are still welcome to take the class but will have to pay the class fee. Contact the Training department for more information (415) 400-7570. STIPEND: $15-$60 total (read below to see if you qualify). SUMMARY: Homebridge Training offers a wide array of continuing education courses for personal care providers and family caregivers. We are approved by the California Department of Public Health to provide Continuing Education Units (CEUs) for Certified Nursing Assistants and Home Health Aides. One CEU is provided for each hour of in-class training. Looking to become a Homebridge Caregiver? 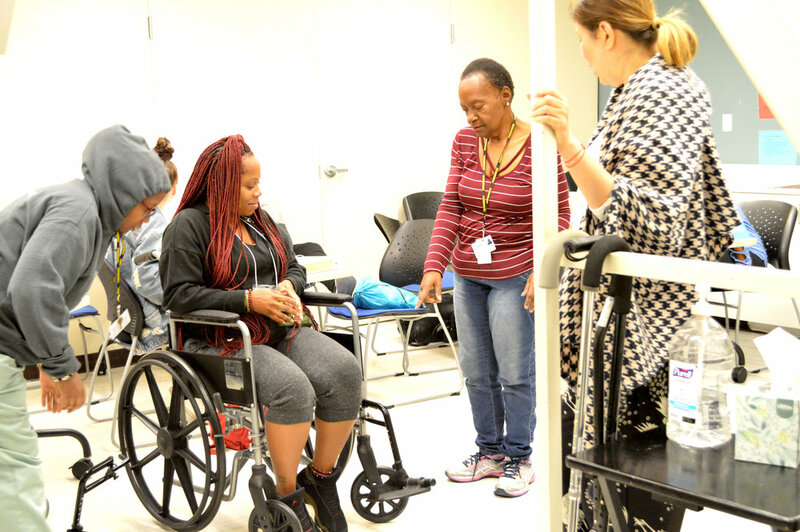 Training classes are intended primarily for Independent Providers and family caregivers in San Francisco’s IHSS program. If you want to become a Homebridge Caregiver, training is not a prerequisite to apply; however, paid training will be the first step of your employment as a Caregiver at Homebridge. If you are looking to apply for the Homebridge Caregiver position, you first have to fill out and submit our Homebridge application. If you have successfully passed the hiring process and you have been offered the position, Homebridge will coordinate with you to sign you up for training.